I am back to the Getty today and must say very excited to be going. I've started the day with a chocolate croissant and e-mailing with some divine ladies in my realm. Friendship, chocolate, beauty...what could be more grand? 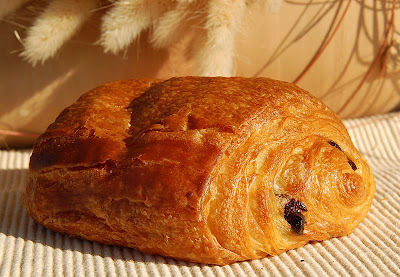 The lovely pain au chocolat is from a local organic bakery called The Baker. It is everything one would want on a chill infused windy morning. Greg would term them "snuggly" as well as "a non food item". I learned this morning that these chocolate filled wonders were created by the Viennese not the French. The proper name for them is actually a Viennoiserie. According to Wikipedia they are also referred to as chocolatines in South-West France and Quebec. The term croissant is really not appropriate since they are not crescent shaped like the typical croissant. My most vivid memories of these delicious pastries was when I was about thirteen years old at a Club Med in Tahiti. Every morning, during that vacation, I would walk over to the palm covered eating area for my morning chocolate croissant before heading out to water ski. I was a rather independent, adventurous child and really enjoyed that particular trip. Back to reality, the temperature has dropped again here in Lala land. Since Friday, we'd been having really beauty filled, warm days...typically Californian. Somehow I'd forgotten that we were still in winter. However, today that cold snap is back in the air and I've returned to the multiple layers of silk and wool. Ah, a trip to Tahiti would be most welcome right about now. Oh well, the Getty and the Oak tree filled Santa Monica Mountains will do just fine. Image of Viennoisserie above is by Luc Viatour, http://www.lucnix.be/main.php, via Wikipedia.